A Garden we will Grow! Loved this pic on Pinterest. I want to get our family garden going again and this has sparked my efforts! 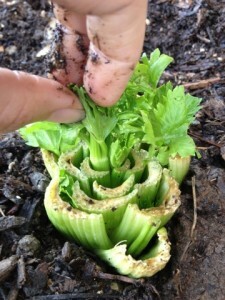 Did you know that you can grow another complete celery stalk from the bottom piece that you cut off and throw away? Cut off the end that you would normally “throw away” and then place it in a small dish filled with warm water. Next “pot” the celery stalk (Stalk Side Up) or place in your garden. Just dig a small hole, fill it with water and set the end in the hole, then cover it up with an inch or so of soil. Water thoroughly. That is it! Now the “end” will grow into a full stalk of celery! Rinse and Repeat and you never have to buy celery again! Talk about a way to save money! I am going try it for sure! Thanks to Chicks In The Road for this idea and the image.